The following is an article written by David Black from US Crow. David Black is trained and Certified to Instruct: Combat Life Saver Instructor and Community Emergency Response Team Trainer. CPR, AED, First Aid. 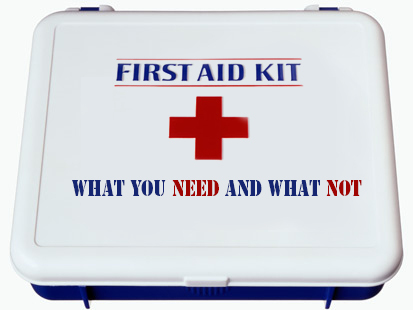 I was at a prepper expo and this question came up… what do you recommend putting in a first aid kit for medications. Now before I go on please look up these drugs on www.drugs.com for better information on the safety of these medications and dosing because they are more reliable than I am. Also some of the conditions below will be difficult or impossible to diagnose and treat if SHTF. So I am not responsible for any adverse outcomes. As always don’t be something you are not qualified to be… a Doctor. Indications: Acid Reflux and Ulcers. Omeprazole will reverse the damage and cause of heart burn. Cimetidine will stop the production of stomach acid. It also is an H2 histamine blocker which is useful in an allergic reaction. Indications: Hangover and Dehyration secondary to Diarrhea. This is going to save more lives than any other medication you can buy. Diarrhea is a big killer. Basically what happens is when you have diarrhea there is some bad juju in your stomach. Your body takes fluid from your surrounding tissue and flushes it out. If you have diarrhea you actually need to encourage it. The thing is that this flushing won’t allow for the absorption of nutrients from food. So you need to replace fluids and electrolytes (what plants crave). Off Label Indications: Acne, ADHD, Burns, Common Cold, Diarrhea, Leprosy, Pnemonia (prophylaxis), Wound Healing. Zinc promotes your immune system. Indications: Sore Throat, Cough, Wounds, Hypoglycemia. Honey has been proven to be a better cough suppressant than Dextromethophan. You can use honey in place of neosporin. Benadryl is an H1 Antihistamine. It also has the effect of don’t operate heavy machinery when you take it. You can use it for pain management because it is hard to be in pain while you are asleep. It also comes in topical form (which I am hoping you didn’t know about) so it can really help with allergic rashes. Acetaminophen is a Cox-2 inhibitor… That means it blocks pain. It is also great in reducing fever. Fever is a tricky thing. It is your natural way to kill off an infection but high fevers can cause serious damage. So you need to monitor someones temperature. If someone is 102F or higher then give them some Acetaminophen and plenty of water if they can tolerate it. Now the caffine part is what makes Excedrine the head ache medicine. All excedrine is, is Acetaminophen plus caffine. So coffee has another reason for you to love it. I know this girl who shall remain nameless but she posted what appeared to be a picture of her in black face… what she was doing wasn’t being racially insensitive. She was using Activated Charcoal as a beauty treatment. I will refrain from commenting on the effectiveness of said treatment. What I can comment on is that Activated Charcoal is the first line treatment in pretty much every kind of ingestion induced overdose. It is in water filters and it is in chemical filters for NBC masks and the JSLIST. So the need to stock this is pretty much overwhelming for anyone who is a prepper. Epsom Salts have a lot of prepper uses beyond the medical uses. Let’s not focus on those as they are mostly a replacement for A-Jax and a beauty scrub to exfoliate your skin. Epsom Salts mixed with water is a POWERFUL laxative. Like don’t make any plans type laxative. One Teaspoon per cup of water and you will empty your bowels. It is also good topically to soak in a tub with epsom salts as it will releive pain from sore muscles. Mag Sulfate has also been used for treatment of Cerebral Edema, Barium poisoning, hypomagnesmia, post operative pain, seizures, head aches, eclampsia, and atrial paroxsmal tachycardia. Bad news is that it is an IV solution so you don’t get to have it without a prescription. Indications: Metabolic Acidosis 600 mg three times a day Orally for your initial dose. Indigestion: 1-2 (770 mg) tablets Orally every 4 hours in a glass of cool water. Wound Irrigation, Eye Irrigation, Ear Irrigation. Sterile Water and Saline take bad stuff and remove it from sensitive areas. If you can find IV bags then you know hypovolemia. Now sure technically you can get Sterile Water IV bags without a prescription but you shouldn’t horde these things because it takes it away from all the people who need them so don’t order a pallet of sterile water. Not that it matters because it is in really short supply anyways. Drinking plenty of water can also help with all kinds of diseases and disorders. Water naturally balances your PH. It promotes healthy skin. It is pretty much awesome. That is why every medic in the world tells you to drink water. What? Doc Black is saying not to take Motrin??? Should I turn in my medic card? No. Ibuprofen is an NSAID. Or Non-Steroidal Anti Inflamatory Drug. Well what we are finding out is that inflammation is part of the healing process. So if you remove the inflammation you remove the healing. again if you stop your body from getting rid of something it doesn’t like you are going to have a bad time. 3. Dextromethorphan (DM) it is just redundant to stock this. Please don’t waste money on it. 4. Antiacids such as tums. Antiacids are bad because they absorb stomach acid which feels good and provides immediate relief. Unfortunately your stomach sends signals to your brain and tells it that it doesn’t have enough stomach acid and to make some more. So it does. Then it comes back. So if you are going to use this do so in conjunction with omeprazole or tagament. Ladies and Gentlemen and fellow preppers. We are going to soon be facing a post antibiotic world. The infections that used to respond to antibiotics are becoming resistent all over the world. Simply put you are not going to be able to use antibiotics as effectively or at all in the future. So you need to look to some other way to prevent a bacterial infection. There are some interesting new ways coming down the pile line. Until then do not rely on antibiotic ointments to do much for you.